Skoda has been lying low for some time now. All that is about to change as the third generation of Superb is all set to be launched in the near future. 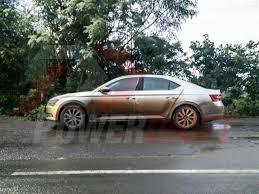 Recently, the new model was spotted in Pune. This is the third generation of the car which debuted in 2001. This generation was unveiled at the Geneva motor show back in February this year. Superb is based on theMQB platform which is also used for the VW Passat as well. The vehicle is larger than the second generation with length of 4861 mm, width 1864 mm and wheelbase of 2841 mm. Even though the dimensions have increase, the engineers at Skoda have been able to shave of 75 kg of the total weight which should transform into significant performance improvement also claiming that the car would be 30% more fuel efficient. The 2016 Superb comes with five petrol engines and three diesel engine options internationally– 1.4 TSI (125 PS/200 Nm), 1.4 TSI (150 PS/250 Nm), 1.8 TSI (180 PS/250 Nm), 2.0 TSI (220 PS/350 Nm) and 2.0 TSI (280 PS/350 Nm) for petrol and 1.6 TDI (120 PS/250 Nm), 2.0 TDI (150 PS/340 Nm) and 2.0 TDI (190 PS/400 Nm) for diesel though it need to be seen as to which ones of these make it to India. Most likely it would be 1.6TDI and 2.0TDI making 150 PS of power for the diesel engines. 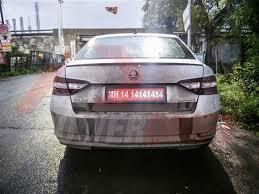 All the cars would be brought as completely knocked down units to be assembled at the Aurangabad plant in Maharashtra. 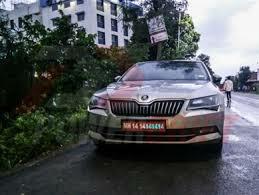 The Skoda Superb would come with a host of new features which would compel buyers to think hard about it before choosing any other option. The features include Key less entry and start system, an 8-inch color touchscreen entertainment system, Hill Hold, front and rear parking sensors, rear parking camera, tri-zone climate control, Bi-Xenon headlights with LED daytime running lights, electrically adjustable front seats, leather upholstery, sunroof. The Superb would be launched by the end of this year or the beginning of 2016. AutoColumn exclusive: Facelifted Tata Nano spied with redesigned rear hatch! !